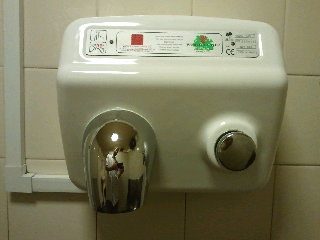 This solid reliable hand dryer with a sturdy enamel finish can look over any installation environment with an old statesmanlike air of confidence, experience and true stoicism, and make it it's own. With it's classic chrome rotating nozzle (for face as well as hand drying) and large chrome 'on' button, all the functional aesthetic boxes have been ticked. The design engineers have expertly struck the right balance between air temperature and airflow for the most pleasing and efficient drying experience. There is big satisfaction to be gained from activating the dryer via the solid punchable knob. This timeless bogwall classic has definitely set a high standard with an all round bathroom hygiene experience.